For small breweries, purchasing liquid CO2 can be a simple and effective method of operation. However, as production volumes and the resulting CO2 usage volumes increase, the cost savings potential of installing CO2 recovery equipment becomes increasingly attractive. In some regions, concerns with reliability of purchased CO2 supply and/or quality of the available CO2 for purchase may be the more significant factor in considering the installation of a CO2 system. Packaged CO2 recovery systems can be purchased with capacities ranging from 20 kg/hr to 10,000 kg/hr. A 20 kg/hr collection system is suited to a brewery producing approximately 100,000 bbl/year. This equates to a 50-bbl x 4-vessel brewhouse producing 8 brews per day. 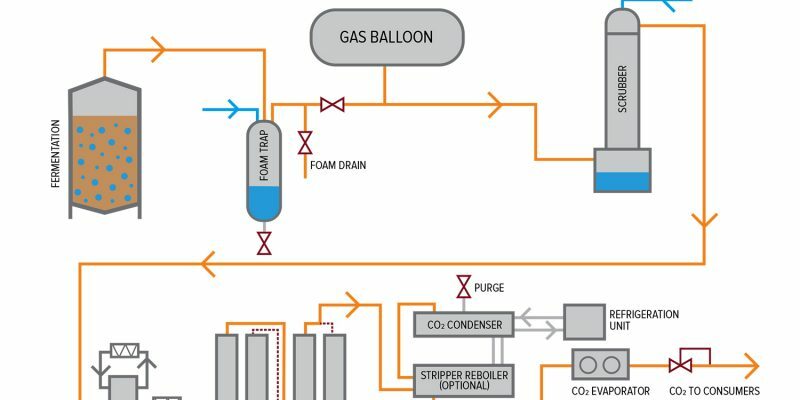 CO2 is typically fed to the main compressors using either booster compressors or using a low pressure CO2 storage balloon. A CO2 storage balloon has the advantage of allowing the main compressors to run at full capacity on an on/off basis. This is the most economical mode of operation. If booster compressors are used, the main compressors will need to run partially or fully unloaded during periods of lower CO2 generation rates, resulting in a lower efficiency. 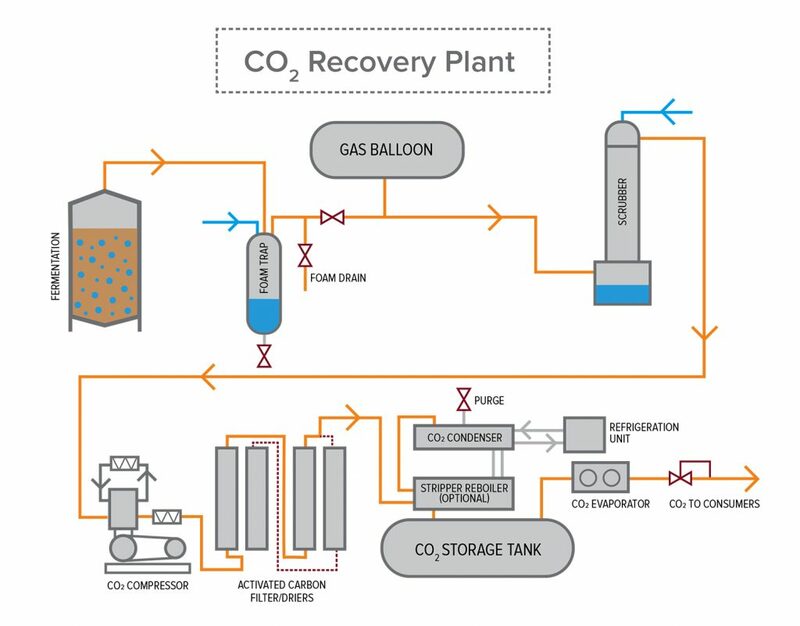 A brewery with annual production as low as 50,000 bbl/yr could operate a CO2 recovery system complete with CO2 storage balloon running on an on/off basis. However, the economic justification becomes more difficult with lower production volumes and in this case reliability and quality of purchased CO2 supply or a policy to reduce CO2 emissions will more likely be the main driving force behind the decision to purchase. 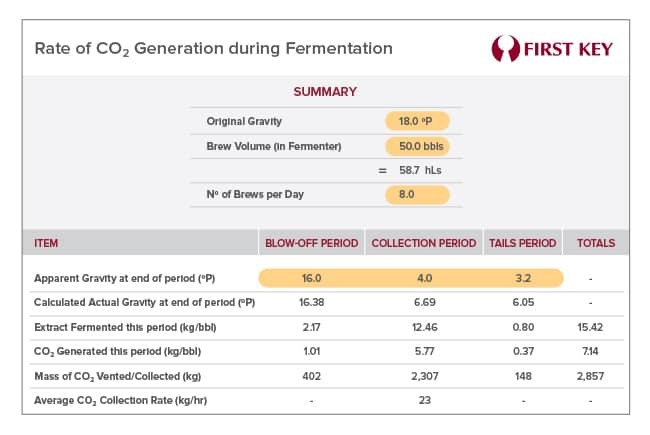 Note: Typically 1.5 vols/vol of CO2 per volume of beer remains dissolved in the beer out of fermenting. This equates to 0.327 kg CO2 / bbl. This quantity dissolves during the Blow-Off period so that all the CO2 generated during the Collection Period is available for collection. From the table above, for a 100-bbl fermenter, 5.77 x 100 = 577kg or 1,272 lb. CO2 is generated and available for collection. On this basis and assuming 10% loss negates increased fermenting volume due to 10% shrink, a facility with a 100,000 bbl/year final product volume could collect up to 1,272,000 lb./year of CO2. Optional liquid CO2 stripping column and reboiler for collection at lower purities. Foam traps can be either vertical or horizontal vessels with city water directed spray nozzles to knock down any foam that may carry over from the fermentation vessels. The recommended installation uses two horizontal foam traps; one vent trap and one CO2 collection foam trap, tied in to multiple fermenting vessels. This arrangement allows for the CIP of the CO2 vent/collection pipe from each fermenting vessel to be CIP’d as part of the normal fermenter CIP operation. Separate CIP nozzles should also be provided in the foam traps. Foam trap CIP must only be initiated when all fermenters are isolated from the foam traps. For safety reasons, it is recommended that two independent automated drain valves be installed on the foam trap drain line to ensure that CO2 is not vented into the room should one of the valves fail open. Area CO2 monitors and alarms should be installed throughout all fermenting, ageing and bright beer cellars. It is recommended that the CO2 vent/collection line be provided with a connection to the fermenter that is separate from the CIP supply to the high pressure tank C.I.P. device. A single line can be used for both CIP supply and CO2 vent/collection. The two connections must be closely connected to the single CIP/vent/collection line with an automated butterfly valve in the line to the CO2 vent/collection connection on the fermenter. The butterfly valve is open during all process operations and closed only during tank CIP to force the CIP solution through the tank CIP device. A good option for CIP of the short CO2 vent/collection branch to the fermenter can be accomplished by drilling two small holes through the butterfly valve seat directed toward the pipe walls. The holes should be sized for a total flow 5 to 10 USGPM at the required pressure drop for the tank high pressure CIP device. In North America, breweries typically use booster compressors to increase the CO2 pressure from the 1 to 3 psig fermenter pressure to approx. 10 psig to supply the main compressors. This allows for a reduction in the CO2 pipe size, but results in a less efficient operation of the main compressors which must often run unloaded due to fluctuating CO2 flow rates. European breweries commonly use a gas balloon to store CO2 at fermenter pressure. This system has the advantage that the main CO2 compressor(s) operate at 100% capacity on an on off basis. This provides the highest efficiency for operation of the compressors. The gas balloon requires more space than the booster compressor system and larger diameter piping from fermenting through to the CO2 compressor(s). Prior to compression, the low pressure CO2 must pass through a counter-flow water scrubber to remove water-soluble impurities such as ethanol. If aerosols (similar to sugars) are determined to be present in the CO2 from the fermenting vessels, an aerosol washer can be added to the scrubber to prevent compressor valve fouling and the resulting higher maintenance costs. The main CO2 compressor is a two stage unit designed to handle wet CO2. The compressors are designed to compress the CO2 from fermenter pressure to approx. 250 psig and include an inter-cooler and after-cooler with moisture separation. The high pressure CO2 is passed through a twin tower activated carbon purifier/deodorizer and Dryer to ensure that the CO2 is suitably purified for food-grade usage and dried prior to condensing. Regeneration is accomplished in the off-line tower using hot air or purge gas. The deodorized and dried high pressure CO2 is now suitable for condensing using a Freon/CO2 condenser. For breweries using ammonia as their prime refrigerant, a cascade ammonia condenser system is required to ensure that CO2 cannot leak into the main plant ammonia system resulting in the precipitation of solid ammonium carbonate which is destructive to the system. Conventional CO2 recovery systems require the CO2 from the fermenter to be at least 99.7 vol% CO2. To reach this concentration, the fermenters must be vented for at least 24 hours prior to switching over to collection. The addition of a CO2 liquid Stripping Column and Reboiler will strip oxygen from the CO2 liquid allowing the fermenter to be switched over to collection at 95 vol% CO2 which occurs after approx. 16 hours from start of fermentation for an additional 8 hours of collection on each fermentation cycle. Because CO2 gas is 1.5 times heavier than air, the Liquid CO2 Tank presents a serious, possibly fatal safety risk in the event of a major leak. Therefore liquid CO2 storage tanks are recommended to be located outside and away from areas of possible impact. In the event that a liquid CO2 storage tank must be located inside, it must be enclosed in a separate room which is provided with an emergency ventilation system and CO2 monitors/alarms. High CO2 usage rates require the addition of a vapourizer to provide the necessary heat source to vapourize the liquid. Electric vapourizers are commonly used in breweries though other options including atmospheric air exchangers are in use. The addition of horizontal foam traps to ageing tanks (e.g. if cylindro-conical tanks (CCTs) are operated as multi-use tanks rather than as uni-tanks) and to bright beer tanks will allow the transfer of CO2 directly from a tank being filled with beer to a tank that is being emptied without the risk of foam carry-over. This opportunity comes with the provision that the beers on the shared system are all similar so that there are no concerns with migration of flavours through the counter-pressure system. Beers flavoured with such additives as lime or other similar strong flavouring must be isolated from a shared counter-pressure system to avoid cross contamination. This type of foam trap set-up has the added advantage of serving as the demarcation point between the infrequently cleaned CO2 supply system and the regularly cleaned production system. Installing a system to allow for acid CIP of bright beer tanks under CO2 counter-pressure provides another CO2 savings opportunity. Some CO2 is lost to the CIP solutions but typical tank pressures after an acid CIP vary between 1 and 4 psig assuming a starting pressure of 12 psig depending on the CIP rates and times. Even with the losses, a considerable volume of CO2 can be saved by installing facilities to enable CIP under CO2 counter-pressure on bright beer tanks.